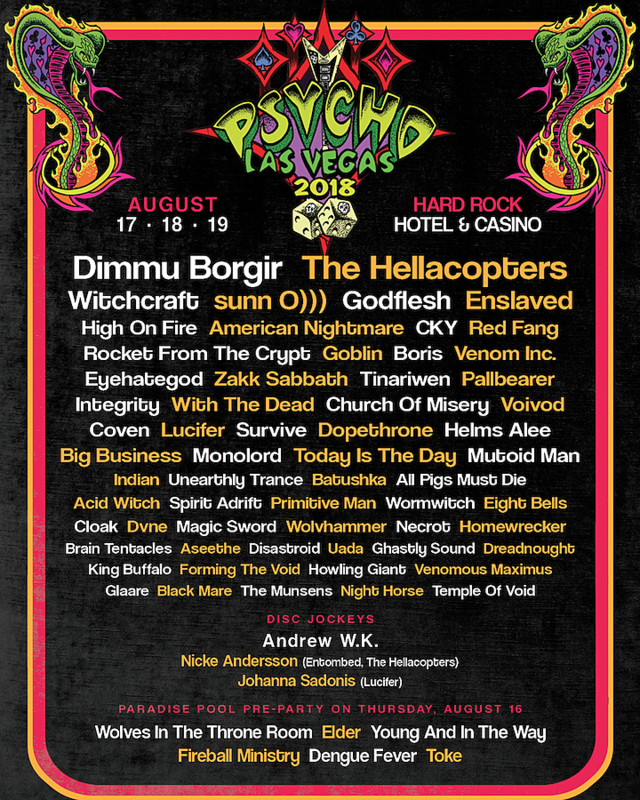 After announcing a very initial lineup in December, the full 2018 lineup for the awesome Psycho Las Vegas festival is here. It includes Dimmu Borgir, The Hellacopters, Witchcraft, Sunn O))), Godflesh, Enslaved, High On Fire, American Nightmare, CKY, Red Fang, Rocket From the Crypt, Goblin, Boris, Venom Inc, Eyehategod, Zakk Sabbath, Tinariwen, Pallbearer, Integrity, With The Dead, Church of Misery, Voivod, Coven, Lucifer, S U R V I V E, Dopethrone, Helms Alee, Big Business, Monolord, Today is The Day, Mutoid Man, Indian, Unearthly Trance, Batushka, All Pigs Must Die, Acid Witch, Spirit Adrift, Primitive Man, Wormwitch, Eight Bells, Cloak, Wolvhammer, Necrot, Dreadnought, and still more. Is that a lineup or what???? There are also DJ sets from Andrew WK and members of The Hellacopters and Luficer, and a pre-party the day before the fest starts (8/16) with Wolves in the Throne Room, Elder, Young and in the Way, and more. The fest happens August 17-19 at the Hard Rock Hotel & Casino in Vegas. Tickets are on sale and the full lineup is on the poster above.